Show me the NEPA Reports! Re: Show me the NEPA Reports! Sunday would be better if the weather's good I'd like to try to get out with the muzzle loader since it's the last day if the weather isn't good for the muzzle loader Saturday would work. I just watched the weather report on wnep, looks like ice making weather all week and through the weekend! That's good new, it'd be really nice to hunt Saturday and ice fish on Sunday. Now to hope and pray it works out that way. I need to get on some ice because my soft water fishing has been terrible. I had to resort to fishing bait for stocked trout. Fish are like beer. After 10 I lose count. I'm hoping to get on the ice this weekend as well...before I resort to driving to upstate NY...although I think thats a better plan! I like those numbers George! Weather is looking grade. I hope the winds dies down and we cap all those lakes nicely and make good ice over the next week. Also hope the snow stays south of us which it is expected to do, but who knows. there will be people walking on water this weekend. But guys, please be careful and have the guts to walk away if it doesn't look right. 17 & 10 = avg of 13.5. From 32 = 18.5. 15/18.5 = 8/10 of one day. We should be fishing this weekend! Be safer everyone. Use a spud! 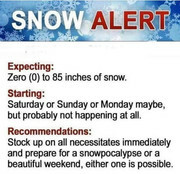 I just got the latest forecast! I read a research article on thicket that basically said find the average temp of the day. Subtract this from 32 for find the freezing difference. Then divide this into 15, the magic number, LOL. This tells you the how many days it takes for 1in of ice to form. Example Weds 33°21. Average temp 27. 32-27=5, 15 divided by 5 = 3. So it takes about 3 days for 1 in or ice to form. We need to wait about 12 days for good ice. I've found that 4 solid days of below freezing usually builds 3.5 inches of ice in my area (100/200 acre lakes). That's more accurate than that Crack Head Joe on 16 in the morning ever was or will be. I'm not sure where they'd find ice that's thick enough to support them. I checked a lake near Merli Snarnoski Park last night and it was wide open with lots of waves due to the wind. Well the weekend is going to be a bust, so I'm hoping to get out Thur or Fri but I don't know of any good ice in Lac, Pike, or Wayne County. Luzerne County is further south and lower elevation, so we have no ice. Has anyone heard anything north of Luzerne County? No direct knowledge, but Stevens or Fords could be viable. Belmont is definitely solid and being fished. Stillwater as well. Dunns pond is good to go. People are on slocum. Park side. Harveys lake has 4 inches at the launch. 3 inches 30 yards out. geez, you nag at us to post some lakes and then you start nagging us about posting.... nag nag nag! nobodies leaving the site and nobodiy is even worrying about other sites. Just fish. You have plenty of lakes to pick, just gotta brush some snow off yer windshield, bring snowshoes and a smitty sled. Any reports from Bradford Co. I got back into ice fishing last year and had an awesome time. Now i would like to find somebody to help me find reports for Bradford co. since i live in Lancaster co. Santa brought me an ice fishing shelter and am hoping to try it out this month. Any and all reports would be awesome. Thanks guyd. I'm just trying to keep the site organized. Sorry if you felt I was nagging you. Some guys like the idea of posting the lakes they fish; especially people who live in Wyoming Valley where there is no ice. I don’t understand why you can’t just go to the REPORTS section? I just posted on Merli and Promised Land. Amen to that, worst than a nagging wife, drives ya nuts. Just freaking fish! Good Friends, Good Family, Good Food, Good Fishin. It already was organized. Go to the reports forum instead if mixing it all up here. That's what the reports forums are for. Probably still grumpy from yesterday morning when I texted him from Merli that the TROUT were biting and everybody was getting their limit.............and he was stuck at work! I would of met you guys ,you should of text me. I wasn't grumpy... You can catch all those nasty stockers you want. I got home from work and had fish tacos with edible fish. Last trout I caught I used for catfish bait and they didn't want any of it either! Glad you guys had a good time.